The Xaact Xtract X-100HSS is a heated portable carpet extractor with 137" water lift and 97 cubic feet per minute (CFM) air flow, a 1000-watt solution heater, a 15-gallon solution tank, and a 15-gallon recovery tank for cleaning carpets. This carpet extractor has a 100 pounds per square inch (psi) pump that runs only when the spray operation is activated for extended pump life. The heater can be turned off for use with an unheated solution. The housing on this carpet extractor is made of rotomolded polyethylene for strength and resistance to damage, and it has two 4" front wheel casters, two 12" rear wheels, and two grip handles for maneuverability. A cleaning wand caddy is built in to the housing for efficient storage. The carpet cleaning wand on this unit has a stainless steel vacuum tube for strength and two jets in the nozzle to facilitate the even delivery and extraction of the cleaning solution. This carpet extractor has a ball ﬂoat vacuum shut-off to help prevent overflow if the recovery tank is full. A 15' vacuum hose and a 15' solution hose are included. Optional 25' vacuum and solution hoses for this unit, and cleaning solutions, are sold separately. This carpet extractor uses a standard 110V power supply. Carpet extractors remove dirt and grime from a carpet or rug with a cleaning solution using pressure, suction, and often heat. They are commonly used in the cleaning, building maintenance, restoration, and home improvement industries to deep-clean rugs and carpets. Carpet extractors, also called carpet cleaners, typically have an input tank for holding a solution of water mixed with a cleaning agent, a pressure pump that pushes the solution into the carpet, and a vacuum that extracts the solution from the carpet into a receiving tank. Many carpet extractors also have heaters that heat the solution and help increase the amount of dirt and grime that can be removed. The pressure and heat allow the cleaning solution to penetrate deep areas of the carpet, while the suction removes the dirt and cleaning solution. 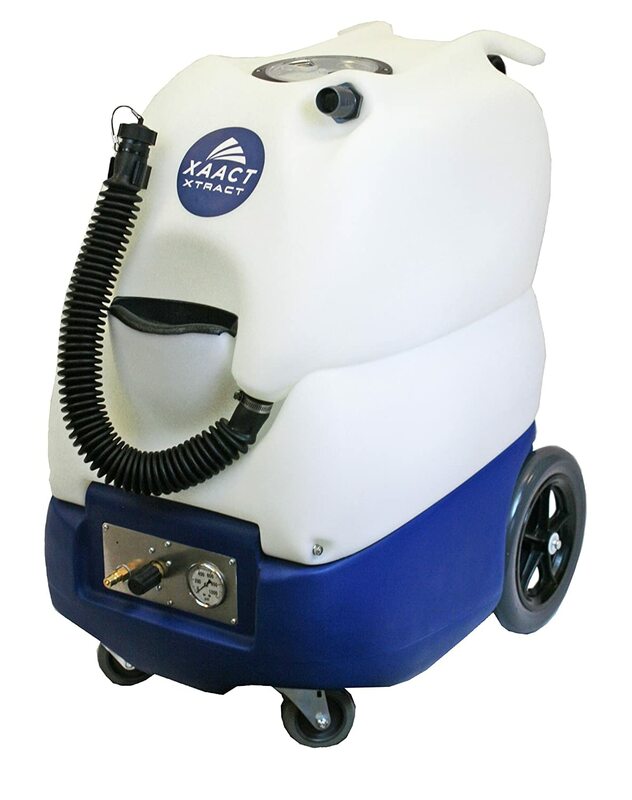 XAACT Products manufactures cleaning equipment, air movers, and tools for the cleaning, restoration, and automotive detailing industries. The company, established in 2011, is based in Coeur d'Alene, ID.